Almost exactly 2 years ago, I was a nervous little 0L who had no idea what to wear in law school. I even wrote this post about it. Coming from being a sorority girl in college, my entire wardrobe was nothing but Nike shorts and oversized frat tanks or forever 21 dresses. I seriously didn't even really have a pair of jeans that still fit, so I basically had to build up an entire new wardrobe for law school. What I said in my original post is still mostly true and if you do a Pinterest search you still pretty much only find pictures of Michaela Pratt (from HTGAWM) outfits. But I'm here to give you the low down on what law school is really like so let me be the first to warn you that if you show up in business casual on the first day of school, you'll be a little overdressed. In general, you'll probably only need a pencil skirt for major events or interviews and will be fine dressing a lot more casually the rest of the time. But let me warn you not to dress too casually. One day my 1L year I was dressed like a slob and of course that was the day when my school email was like *surprise* the Court of Appeals justices are on campus today for lunch. I was too embarrassed to show up looking so sloppy because I didn't want to be disrespectful so I missed out on a great opportunity simply because of my outfit. And this summer I wasn't in the mood to put on makeup or do my hair and of course that was the day that my professor decided to move up my presentation to that day so I had to stand up in front of my class looking like I just got off a 12 hour flight. So long story short, it is worth it to put some effort to look decent for class. If you're coming straight from college and have no clothes like I did, this can get really expensive really fast. Luckily from my experience of spending 5 months abroad, I've learned about the magic of a capsule wardrobe. It's genius because you only have to invest in a few basic pieces that all mix and match to make a lot of outfits with not a lot of clothes. Jeans — Start with jeans, because you can get by with one or two pairs of jeans to begin with. A pair of light wash boyfriend jeans and a pair of skinny black jeans will literally go with anything. Yep, you can be that level of casual with jeans in law school. 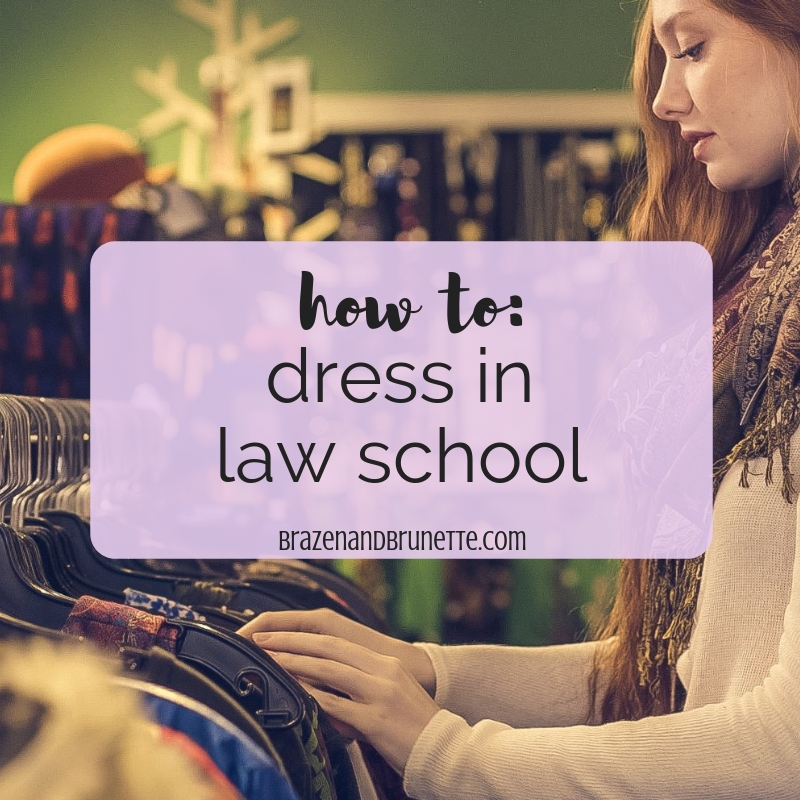 Leggings — Actually, you can even pull off leggings in law school. Just try to look nice and instead of a big t-shirt, try wearing a cute top and a cardigan. Since it is grad school though, I usually dress up my leggings with the rest of my outfit just a little so I at least don't look like I've just been out running errands. Shirts — With shirts, make sure that they match each pair of your jeans (this should be easy) and that they're versatile. What I mean by that is that the same shirt will look just as good on you standing up in class reciting a case as it will while you're at dinner on a date. The easiest thing is to start out with neutrals like a white, gray, black, and black and white striped shirt. Monochromatic is a classic color scheme that not only will match each of your pants, it will also be super easy to add color in. Dresses — The next thing I suggest you look in to are the nicer basics. I looove t-shirt dresses and probably wear one to class at least once a week. They're comfortable but not so casual that I would feel embarrassed meeting a new lawyer in. Start with a chambray one, a striped one, and a solid color. Another thing I'm obsessed with is rompers. Both of these are great investments because you can make them work for both class and bars on the weekend. Cardigans — Another nicer basic to invest in are cardigans. Either the AC will be blasting in your classroom or it'll be cold outside so they're always good to have on you. I keep one stashed in my carrel and if you have a job that's semi-casual, you can use these to get away with wearing spaghetti strap shirts to work. Sweaters — One last thing to add is a chunky knit sweater. You can wear them with jean shorts when it starts getting cooler or leggings when it's actually cold. They also are great to wear with long socks for a Netflix marathon over Christmas break, jussayin. To make getting a new wardrobe cheaper, I suggest getting these basic shirts and then every month or so get a few new shirts in color and by the end of the year you should have a pretty solid wardrobe foundation. See what I'm talking about?? Shoes aren't usually as "trendy" so a pair you buy this weekend will probably still be in style in 3 years. And to get real with y'all real quick, stress eating is a real problem in law school but the nice thing about shoes is that if you gain 10 pounds they'll all still fit you just as well. Sandals — As you may remember, I worked at the Texas Capitol during the summer when they're not in session so everyone tends to dress more casual. One day I saw a girl wearing Tory Burch Miller sandals and even though they're basically flip flops, they looked soo classy and actually not out of place at all. Obviously I had to get them so I got the black patent leather sandals and they've turned out perfect. What's funny is that in my office this summer, four other girls have worn these to work! Another sandal option that goes with everything but is half the price of Tory is Jack Rodgers. Both of these sandal brands are well known for their quality that lasts for years and also are always in style. Sneakers — I love my Converse because they go with everything plus are super comfortable. I wear them several times a week to class and they're my go-to shoe to pack when I'm traveling. Even if you're just wearing leggings to class, swap out your tennis shoes for these and go for a Piko if you're set on wearing a baggy shirt and you'll look way more put together while still being just as lazy. Converse sneakers are classic, but another great sneaker to consider is Adidas. They're a little more in right now and look great with a pair of ripped jeans and a t-shirt. Heels — I'm 5'2 so I personally love wearing heels to class just so my feet can touch the ground (short people probs lol). To pull this off without looking too overdressed for class, my favorite heels to wear are wedges when it's warm and booties when it's cool. My 2L year I got a pair of Steve Madden wedges and have been wearing them to my summer classes because they're so comfortable. To save money, get one pair of booties that will go with everything. The Toms Majorca is my personal favorite because it's brown and black so it basically goes with everything plus it's a peep toe so your feet won't get too hot and you can wear them Spring - Fall. Boots — Get you a pair of cognac riding boots. They look great with dresses without seeming too dressy (plus keep your legs warm in the fall) and always look cute with both jeans and leggings. Once it starts to get cool, I basically wear these every day to class. Another set of boots to save up for (or ask for birthday/Christmas) is quality rain boots. After years of making due with cheap Target boots, I finally got a pair of Hunter Rain boots my senior year and I literally get so excited when it rains so I can wear them. Get them in red! I swear every time I wear them I get complimented on the color. They run big but don't size down and then in the winter you can wear thick socks and make them into snow boots. And that's it! I know this doesn't sound like a lot, but that's the point. If you get shoes that go with practically any top or a dress that versatile for almost any situation, you won't need to get a whole lot. You'll see that this is a good thing because if you're going to law school then you're about to be paying like at least $90k. To build up a wardrobe on a student budget, keep an eye out for when any of these things go on sale, and buy them once they do. The Zappos sale tab is great for this because there's always something on sale! Another easy way to make this as cheap as possible is to start out with the bare minimum (one pair of jeans, two pairs of shoes, and three tops) and buy one or two things each month. Huge shoutout to Zappos for collaborating with me on this post!